Even Cincinnati’s “frail sisterhood” enjoyed the fad. Bicycles really captured Cincinnati’s imagination in the mid-1890s. Dozens of bicycle clubs sprung up, newspapers launched bicycle columns and the Cincinnati Police initiated bicycle patrols. It seemed like everyone in town was riding a “wheel” as bicycles were known then. Even Cincinnati’s “frail sisterhood” enjoyed the fad. Madam Mitchell recognized the policemen and sped north on Race until she was forced to stop at Ninth Street when an electric streetcar stopped to board passengers. She was arrested, taken to the Central Station at City Hall and charged with loitering. All for riding a bicycle? Yes. In the 1890s, Cincinnati enforced a “segregated district,” popularly known as a “red light district,” to contain prostitution. Police Chief Philip Deitsch closed all the brothels outside the red light district and ordered all prostitutes to remain out of public view. 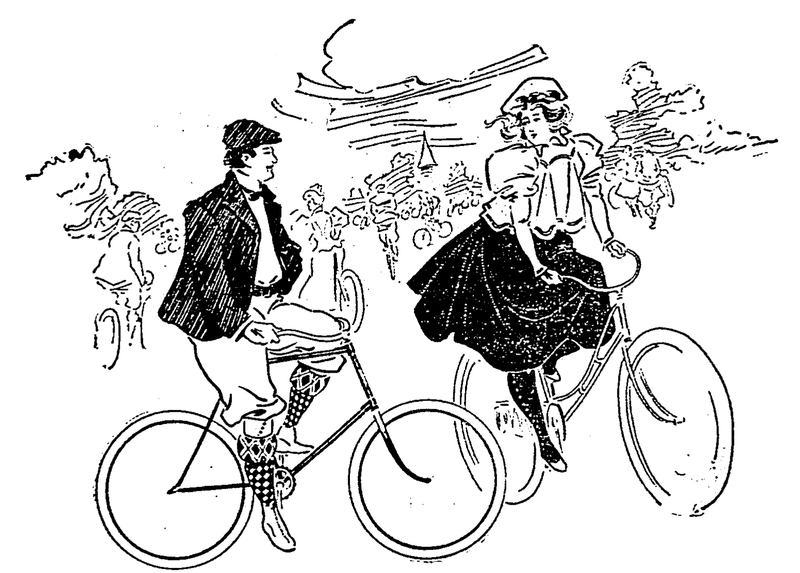 Cartoon of man and woman on bicycles. From Cincinnati Enquirer 30 May 1897. Image extracted from microfilm by Greg Hand. 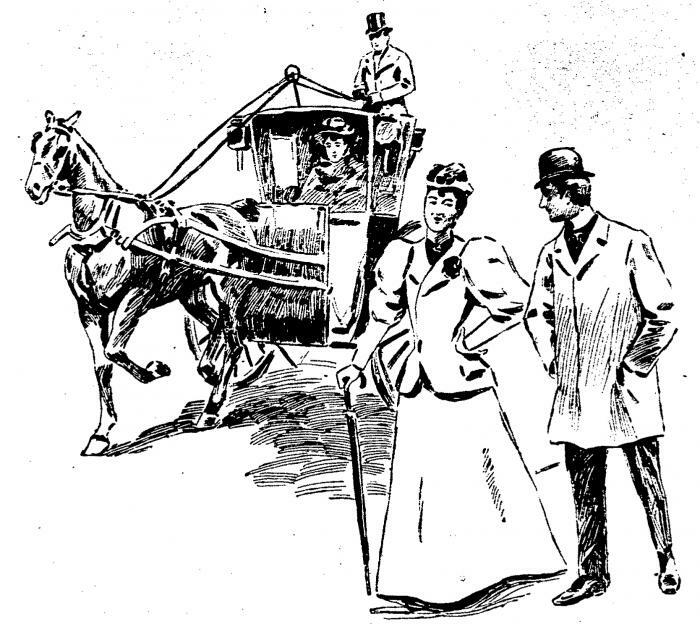 Cartoon of women and man near carriage. From Cincinnati Enquirer 13 December 1896. Image extracted from microfilm by Greg Hand. Prostitution and the patronizing of prostitutes was never exactly legal in Cincinnati, but these moral vices were not prosecuted outright as is done today. There are very few reports of anyone being charged explicitly with prostitution. The attitude of the police and courts seems to have been that prostitution was inevitable, but should not interfere with polite society or normal business. Arrests were uncommon unless someone was disturbing the peace. However, cops would “pull” a brothel if it got too rowdy or the neighbors complained. Prostitutes were almost invariably charged with loitering and fined between $5 and $25. Madams faced charges of “keeping a disorderly house” or “harboring lewd women” and fines of $100 to $300. Gallivanting around the polite streets of Cincinnati, especially in a carriage drawn by a spirited team, was a common activity for the city’s prostitutes and their clients. A popular route was Spring Grove Avenue, as gentlemen conveyed their “dates” out to Chester Park. This was just the sort of behavior that inspired the police to raid a few brothels in order to set an example of discreet behavior. Some cops even stopped prostitutes in carriages just to extract a little bribe money. This wasn’t always a good idea. A Cincinnati police officer got a rude awakening in 1886 when he tried to shake down a couple of Belle Curry’s girls. The officer apprehended them as they returned to their Broadway brothel from a carriage ride around town. He was about to arrest them on a charge of disturbing the peace when one of the women offered to settle the case for $5, paid next evening. The officer agreed to the bribe and, the following night, rapped upon the front door to see the lady in question. As it happened, Police Chief Deitsch and Chief of Detectives Phillip Rittweger were at Belle Curry’s that night “on official business.” The Chief suspended the officer immediately. In this case, the Cincinnati Enquirer reported that there had been many complaints of police officers attempting to shake down “women of the town,” and noted that the Chief had worked to put an end to the extortion.